The Kiwi has four sisters. Each of them is married. Each couple has two children, ranging in age from our eight-year-old Little Missy down to the newest addition, a sleepy, snuggly sausage of a little girl who arrived when we were in New Zealand during early January. For a lot of that time, many of us were staying at the Kiwi’s parents’ house. That makes a potential 12 adults + 9½ children (that smallest little lady isn’t quite able to sup at table yet) at mealtimes. A lot of mouths to feed, and all of them with opinions on what they should be fed! There were plenty of barbecues, with sausages and steak and chicken drumsticks. There was a vast slow cooker full of hand-rolled meatballs, served over acres of spaghetti. There were great big floury baked potatoes with grated cheese, crispy bacon and a big bowl of crunchy ‘slaw. Our impressions of this meal were in no way influenced by the giant Singapore Slings which we were handed beforehand. (Honest.) There was slow cooker pulled pork. There were burger nights. There was a mac and cheese evening, Caroline-style rather than NZ-style (meaning: I used lots of veggies rather than bacon, almost causing ructions). 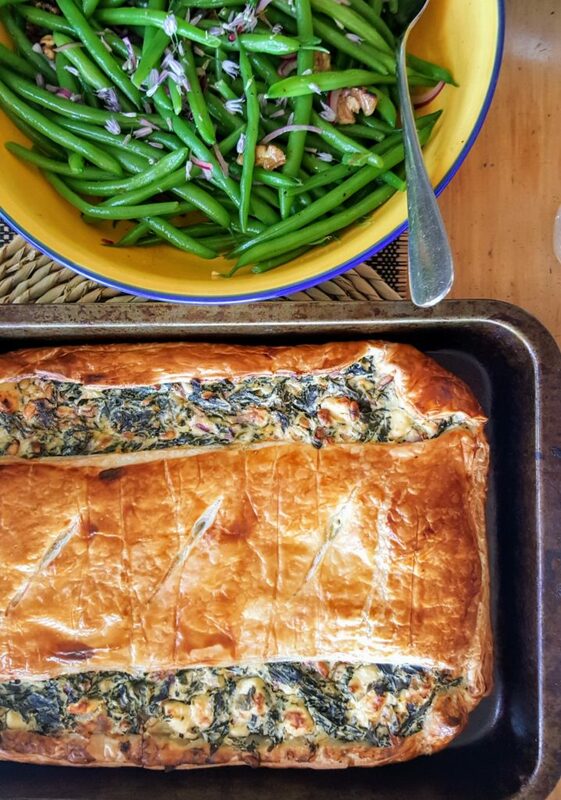 One of the days, the Kiwi and I raided his mother’s garden, came back with armloads of perpetual spinach and silverbeet (known as Swiss chard in Ireland, but it never tastes quite as good here) for a couple of big spinach, ricotta and feta Spanakopita pies. This is from a recipe that originally, 20+ years ago, originated from the Quay Co-Op in Cork and has been through many homes and gatherings and variations with me since then. (Here’s the version that I used to cook back in 2005, when I was first living in New Zealand. You’ll have to excuse the awful photo. Basically, it’s all about making it easy. 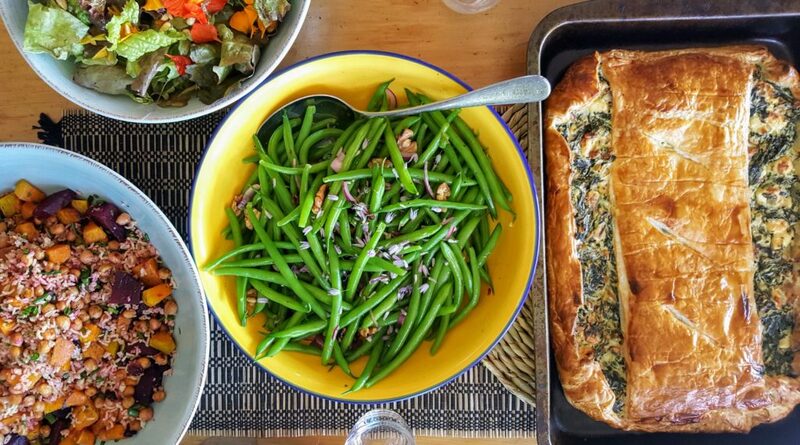 I use puff pastry because it’s always easier to track down and work with than filo pastry, and I make this dish with whatever greens I have on hand at the time – those armloads of just-picked perpetual spinach and silverbeet; chard and kale and sorrel from our own garden; a bag of supermarket-foraged baby spinach leaves. For that particular night, as we were feeding the multitudes, we made two large pies, along with several salads. There were green beans from the garden, barely cooked and then dressed with lemon juice and walnuts, a big bowl of mixed salad leaves, and a roast beetroot, squash, chickpea and rice salad with tomato pesto dressing. Just like every time family gets together. If the spinach / silverbeet / kale you are using is past its first flush of youth and looks a bit tough, then it’s worth pre-cooking it. Simply shred the leaves, rinse under the tap and put into a hot pan and toss until wilted. It cooks in its own steam. Cool and drain off any liquid before combining it with the rest of the ingredients. Serves 4-6. Preheat the oven to 200°C and lightly oil a rectangular 39cm x 27cm x 3cm tin. Unravel the puff pastry – easiest done once it has been out of the fridge for 10 minutes – and, using a rolling pin, roll it out until it is approximately one-third larger than when you started. Cut off one-third of the pastry and set aside. Use the rest of the pastry to line your tin. Wash, dry and chop the spinach then combine it with the ricotta, onion, eggs and nutmeg. Season well, fold in the cubed feta cheese and scrape the mixture into the pastry-lined tin. Lay the rest of the pastry on top for the lid and fold in any overhanging pastry – I never worry too much about it meeting in the middle, as you can see from the picture! Brush with beaten egg or milk to glaze and cut three slits into the middle of the lid. Place into the oven on top of the hot baking sheet – to ensure that the base of the Spanakopita is cooked – and cook for 40-50 minutes until well-risen and golden brown. Serve warm or at room temperature.